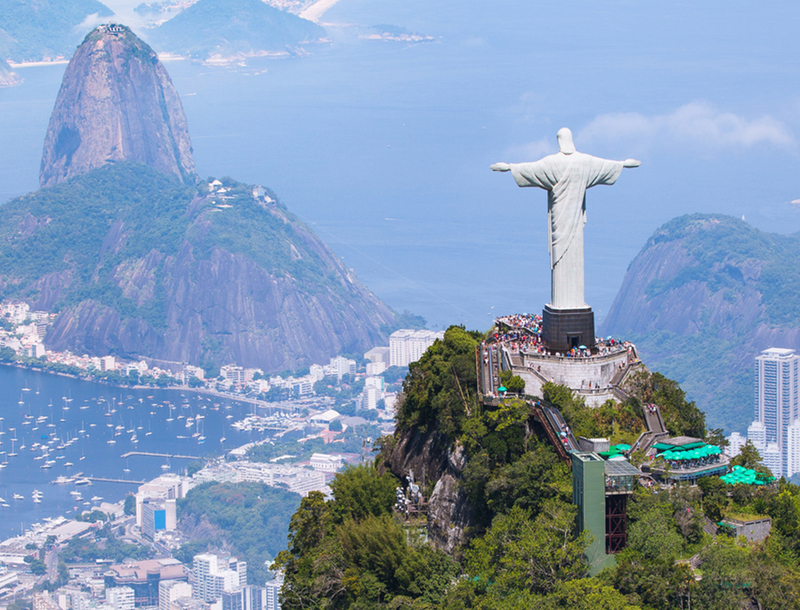 The impressive “Christ the Redeemer” statue in Rio de Janeiro stands tall at 38m atop Mount Corcovado. The statue is built from reinforced concrete and covered in green toned mosaic tiles. In 2006, a Chapel at the foot of the statue was consecrated. This was on the monuments 75th anniversary. The Chapel is a popular choice for weddings or baptisms. The remarkable “Christ the Redeemer” is of the most visited sites in South America. Each year, just under 2 million people visit the statue. On Easter Sunday in 2011 it received a record breaking 14,000 visitors. The concept of having a monument on Mount Corcovado first came about in the 1850’s. At the time, it was proposed that a statue to honour the then Princess Isabel be erected. However, the idea never eventuated. Many years later in the 1920’s, the idea re-emerged. Instead of a monument honouring the Princess, a religious statue became the focus. A competition then opened for it’s design. Entries included everything from a Christian cross, to Jesus with a globe in his hands, as well as a podium symbolising the world. After many drafts, Costa came to a final design for which he enlisted the help of French engineer, Albert Caquot. Initial construction began in 1922 and took nine years to complete. the Catholic community in Brazil funded the $250,000USD (equivalent to $3,300,000 in 2015) to build. Over the years, after damage from weather exposure the statue has undergone has several renovations. The most significant ones being in February 2008 and January 2014. On both of these occasions lightning strikes broke parts of the statue including dislodging a finger. The idea of building a monument to Christ came about following World War I. At this time many Brazilians felt the need for something symbolising hope and peace across the city. After a decade of construction, the statue continues to bring joy and happiness to many people. The statue was inspired by Religion but as you walk around and get to know the people that visit it and live nearby, you’ll find that people never really saw the statue exclusively in a religious light. One of the instigators of the project in the 1920’s, Count Celso, described the statue as a “monument to science, art and religion”. So, whilst the statue is religious, it doesn’t divide the country at all. Rather it unifies everyone, no matter his or her beliefs; many people see the statue as just someone giving the city a welcoming and loving hug.